My interest in reproductive research was initially sparked during my time growing up on a local farm, where I came to appreciate the importance of artificial breeding technologies both in the context of livestock improvement and for the conservation of our country’s unique fauna. More recently, my firsthand experience with the emotional toll that an infertility diagnosis can cause has inspired my commitment to trying resolve the mechanistic basis of infertility and harnessing this knowledge for the development of improved therapeutic options. My research focuses on refining our knowledge of the reproductive process with the ultimate goal of resolving the root causes of infertility; a condition that now afflicts approximately 1 in every 6 couples in Australia. It is my hope that our research will enhance our ability to diagnose infertility and allow us to develop effective therapeutic strategies to alleviate the burden of infertility. Professor Brett Nixon is a member of the HMRI Pregnancy and Reproduction Program. 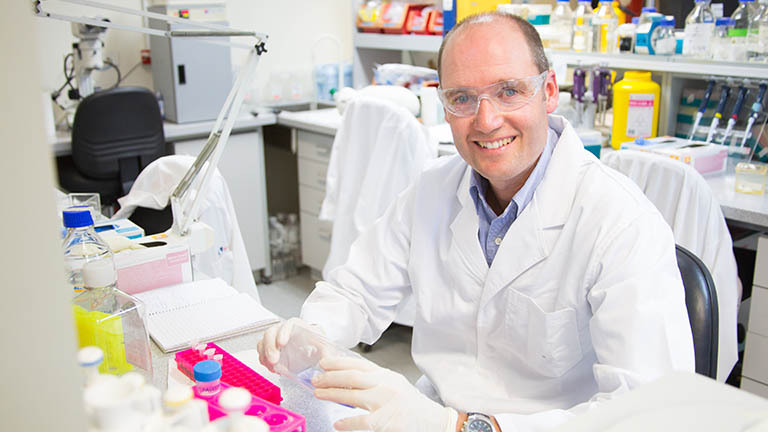 He has recently been appointed to the position of Senior Research Fellow of National Health and Medical Research Council of Australia and co-Director of the University of Newcastle’s Priority Research Centre for Reproductive Science. Brett’s research career commenced with a collaborative PhD project between the Vertebrate Biocontrol Cooperative Research Centre and the University of Newcastle, focused on identifying gamete proteins that could be targeted for the development of contraceptives for feral pest species (i.e. rabbits, foxes, and mice). Brett then undertook post-doctoral research at Emory University, USA where his work centred on characterising the mechanisms by which a sperm cell is able to recognise and bind to an egg; the cellular interaction that is responsible for initiating fertilisation, and one that often becomes defective in cases of human infertility. In 2001, Brett was recruited to the University of Newcastle, where he has established an active research program focusing on the use of humans and models to characterise the reproductive process and how this becomes so dramatically compromised in cases of infertility. His current projects are of strategic importance for understanding the causes of human infertility, the design of new methods for fertility regulation, and determining how the quality of the male and female gametes influence the health and wellbeing of the offspring. Brett has communicated his research findings through the publication of more than 120 scientific articles and delivery of many invited national/international presentations including the Presidents Lecture in 2019 (one of the most coveted awards from the Society of Reproductive Biology). In recognition of his contributions to the field, Brett was elected Fellow of the Society of Reproductive Biology (2015). Brett has also received numerous institutional/national accolades that attest to his commitment to the training of the next generation of researchers.